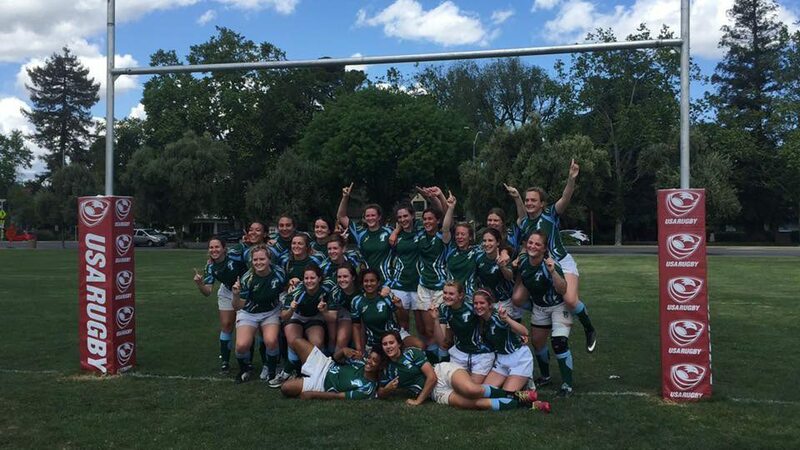 DAVIS, Calif. - Tulane University built an early lead and held onto it Sunday to overcome Humboldt State University, 39-32, and become the 2016 Women's Division II Spring Champion. 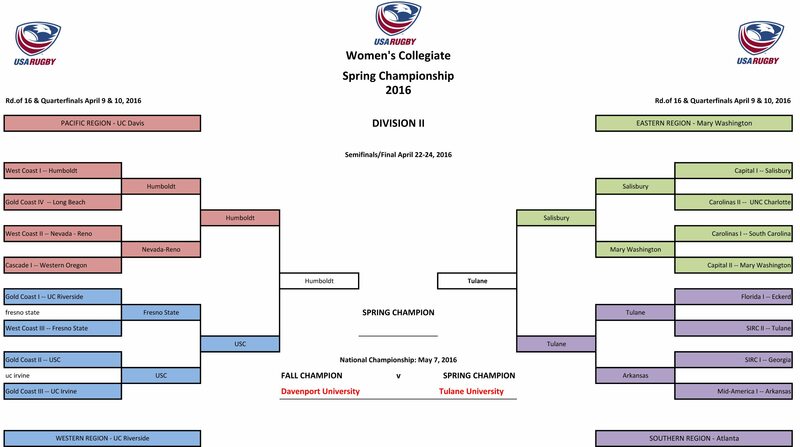 The Championship match, held on the campus of University of California, Davis, featured 12 tries and followed two high-scoring Semifinals played Saturday. University of Southern California won the consolation match against Salisbury University, which also ended its 2015 Spring Championship campaign in the Semifinals. The Green Wave will head back to the Golden State for the May 7 College 15s National Championship weekend at Saint Mary's College, where it will play Fall Champion Davenport University for the DII National Championship title. It looked like Salisbury was ready to shake the 2015 monkey off of its back when it raced out to a 12-0 lead after 20 minutes in Saturday's Semifinal against Tulane. The Green Wave would level the match at 12-all going into the break, however, and back-and-forth scoring saw Salisbury take a 31-24 advantage. Tulane kicked into gear in the final 20 minutes of the match, keeping Salisbury out of the try zone with its strongest defensive asset: attack. The Green Wave scored five tries - two converted - to take the lead and add to it at 53-31 before the final whistle. The Lumberjacks of Humboldt conceded just 12 points in two matches at their regional in Davis two weeks prior to their Semifinal kickoff against USC, and only let the Trojans cross the try line three times Saturday. Lila Bell led the way with a hat trick of tries and several conversions, with USC's Joyce Chuinkam's second try concluding the scoring at 40-15. Tulane was able to set out its strategy for the Spring Championship Final overnight having watched Humboldt's dismantling of USC, and starved its opponent of scoring chances early. Each team scored a try in the first 10 minutes before Tulane put its stamp on the match with three more scores ahead of the halftime whistle. Humboldt cut into the deficit with another five points in stoppage time prior to the break via Meredith Conrad-Forrest's second of the match to make it 24-10. Jessica Mallindine, head coach of the Green Wave, pointed to her side's first taste of double-header playoff action at the Round of 16/Quarterfinals to be beneficial in her team's confidence of its physical and mental stamina heading into the weekend. Though Humboldt came out of the 10-minute break on the front foot, scoring a third try to bring the match to 24-17, intelligent game management and a brilliant individual try from Emma Peterson in the 76th minute extended Tulane's lead to 39-27. Tiana Barron's hat-trick try served only as consolation for the Lumberjacks in the 79th minute, bringing the final score to 39-32. The Green Wave returned to Louisiana and will recover before starting preparations for the May 7 National Championship match against Davenport. The Panthers have been busy on the pitch this spring following their Fall Championship victory over Winona State, and will readily accept the challenge to improve its seasonal championship to a National Championship.